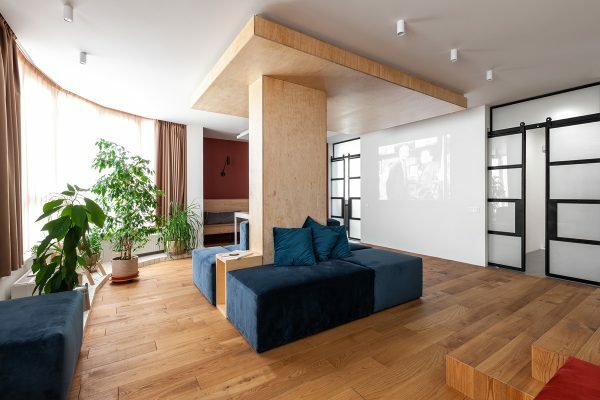 This spacious open plan home is the L.Apartment, by MalyKrasota Design, located in Kyiv, Ukraine. 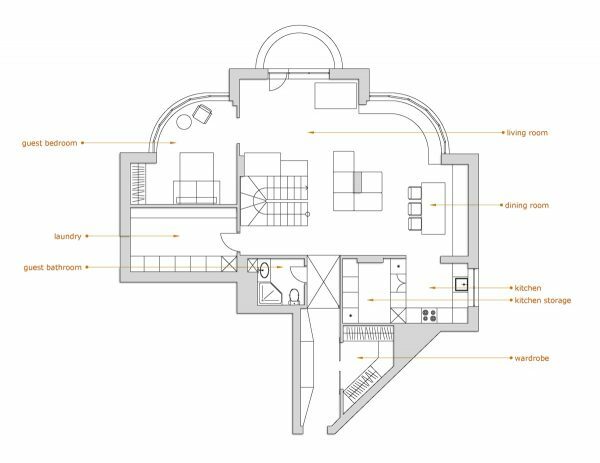 The 190 square metre living space is home to a large family with young children, which is what shaped the interior. The brief called for plenty of open space in which the kids would be free to run around and play games with minimal obstruction. 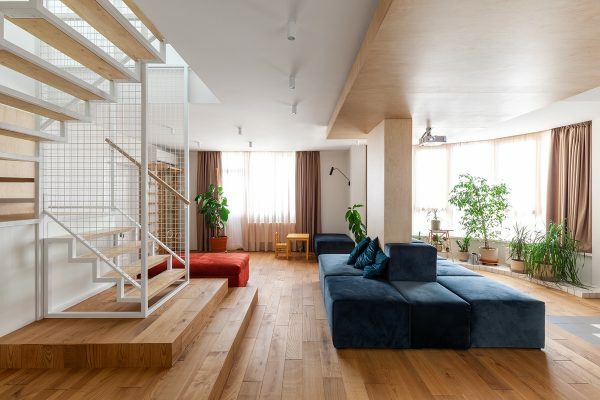 The solution for the main living and dining room was a set of modular seating that can be rearranged into different compositions to suit a multitude of family leisure activities. The relaxed room would welcome guests and their energetic young families too. Bare wood floors throughout the ground floor mean that the kids’ running space comes without the trip hazards of rugs or thresholds. 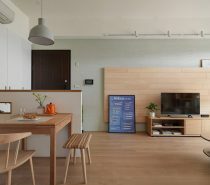 The modular sofa is arranged around a central support column, leaving the rest of the floor free as one complete loop, like a race track for little feet. The array of indoor plants can be set upon a raised tiled border to keep the running track clear of obstacles. 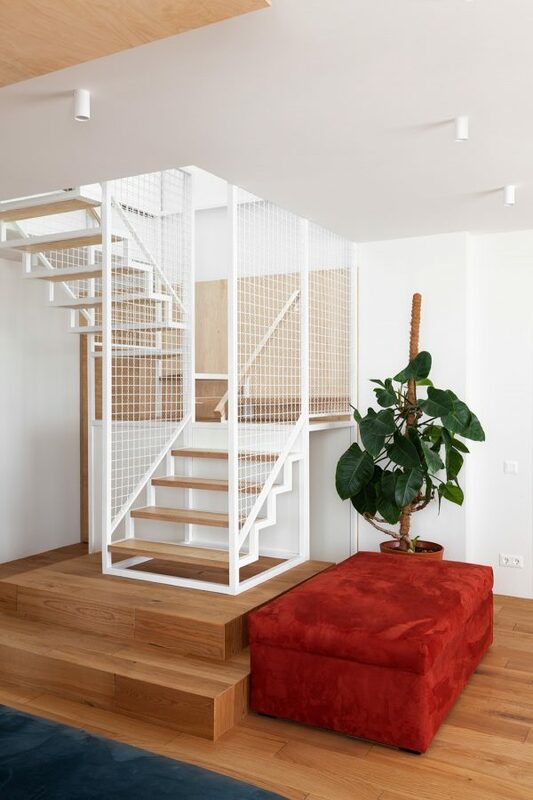 A couple of chunky wooden steps lead into an open tread metal staircase design with mesh balustrades. The transparent sides allow family members to see and be seen during their ascent and descent. 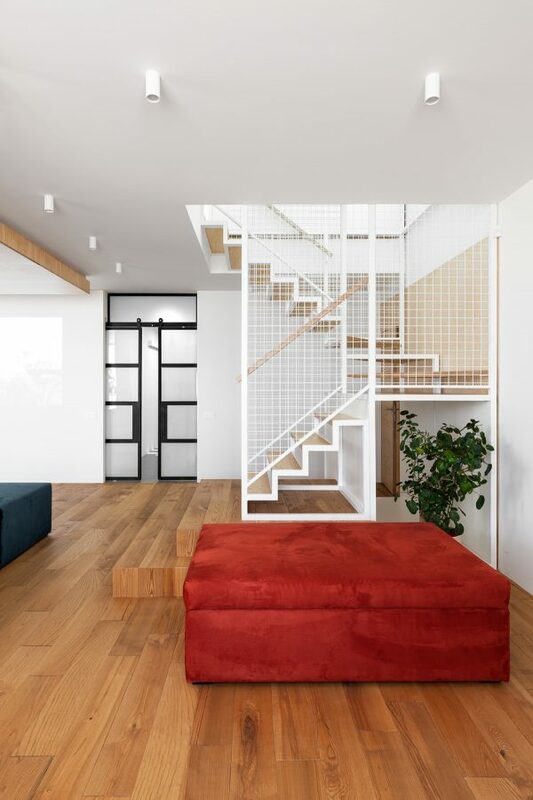 The see-through staircase allows natural light to brighten the stairwell, and also to pass straight on through to illuminate the space on the other side. A large red ottoman provides another place to sit, climb, ride like a cowboy or sail the seven seas. Talking of the seven seas… That cute whale dining room pendant is available on Etsy! 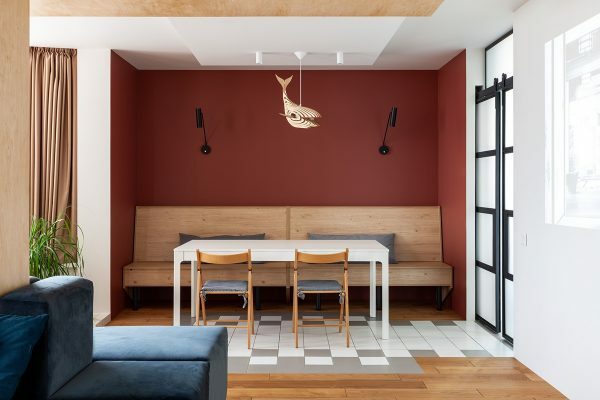 Below the wooden whale, a dining table and chairs have been teamed with a long dining banquette to seat a few extra diners. The wood flooring gives way to a tile design beneath the dining set, providing a hardy wipe clean area for scraping chairs and mopping up the kids’ spills. Two cushions provide extra comfort against the solid wooden banquette seat. A couple of black modern wall sconces throw a bit of light on the subject. 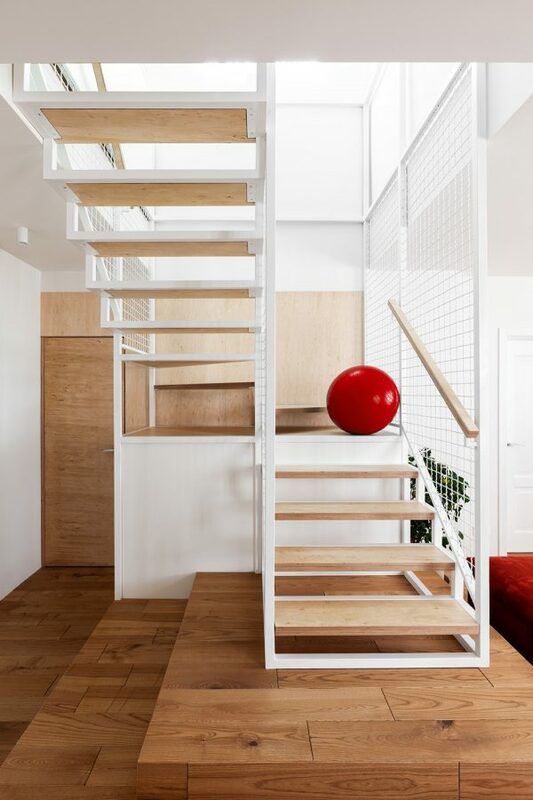 The open stairs can serve as a viewing perch up out the way of playtime chaos. Two sets of slide away double doors reveal more downstairs rooms. 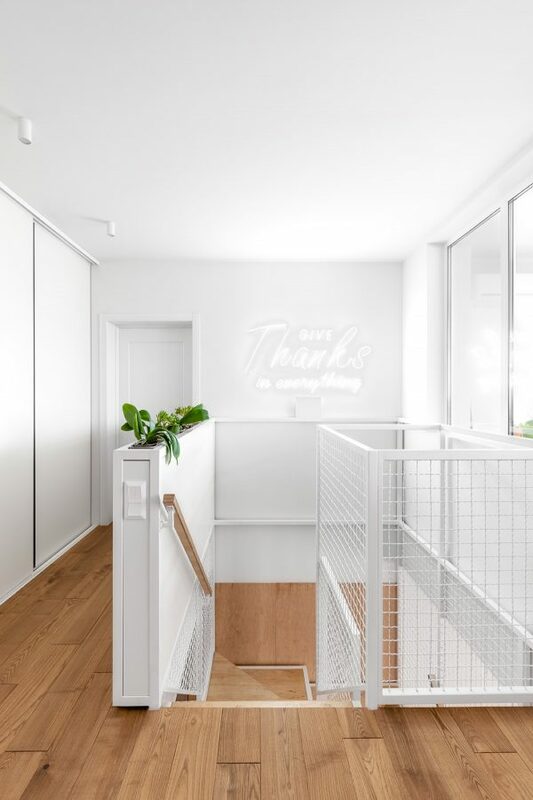 The sliding design means that children won’t get knocked by swinging doors, avoids continual slamming by the kids, and prevents little fingers from being jammed. 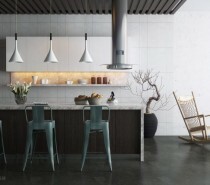 A dark grey kitchen hides behind one set of sliding doors. 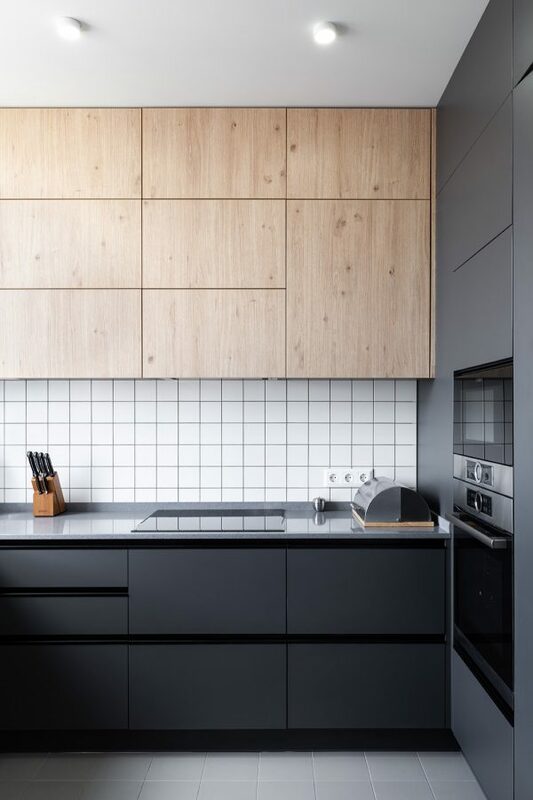 The scheme is lightened by wood wall cabinets, a wood trimmed bread-bin and a wooden knife holder. The other sliding doors open to reveal the home entryway. 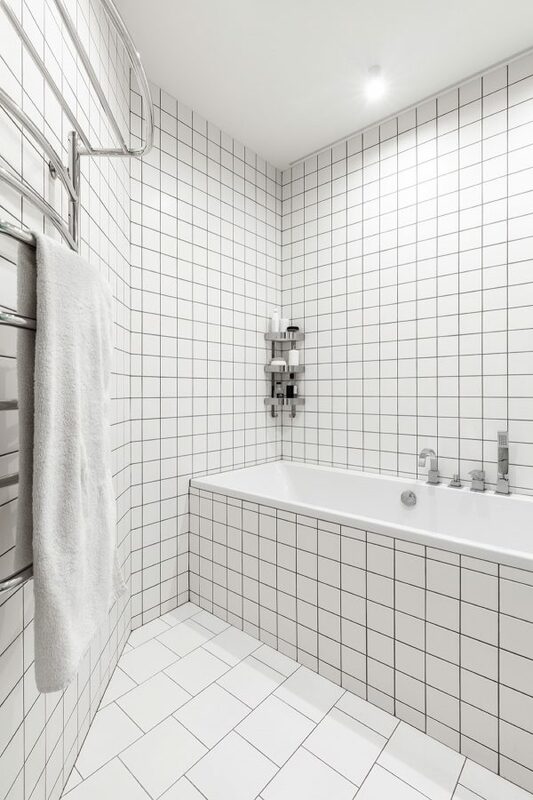 The hallway is practically floored for a young family, in a checkerboard pattern of wipe-clean grey and white tile. A bespoke storage bench has been built along one wall to deal with multiple collections of shoes. A variety of wooden wall hooks await coats on angular wooden wall panels. 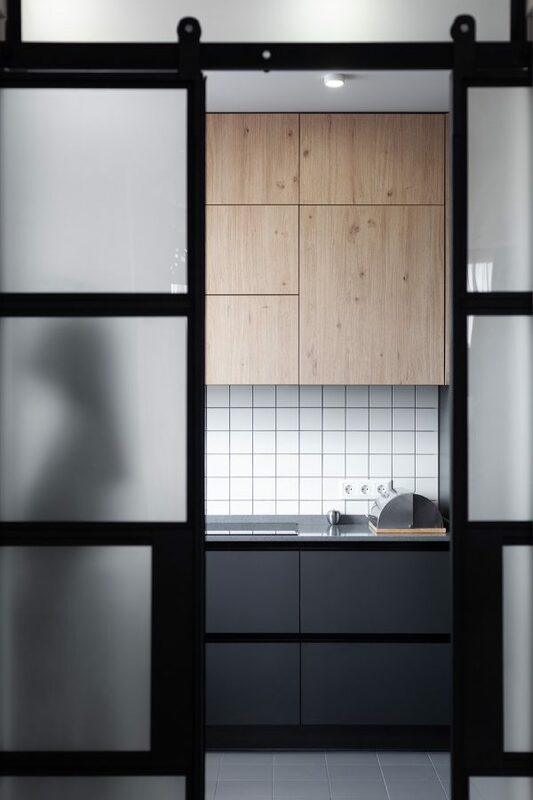 Sliding mirrored doors conceal a recessed storage cupboard. An inspirational quote lights the top of the staircase, next to a built in planter along a balustrade. In contrast to the play space downstairs, upstairs is a quiet and peaceful place that holds all of the bedrooms. The parent’s bedroom is filled with calming decor in a palette of taupe and white. A swing arm wall lamp lights each side of the headboard for reading. The headboard runs straight into a bespoke desk, which forms a simple study area in front of a window with views of the city. The are two children’s bedrooms upstairs. 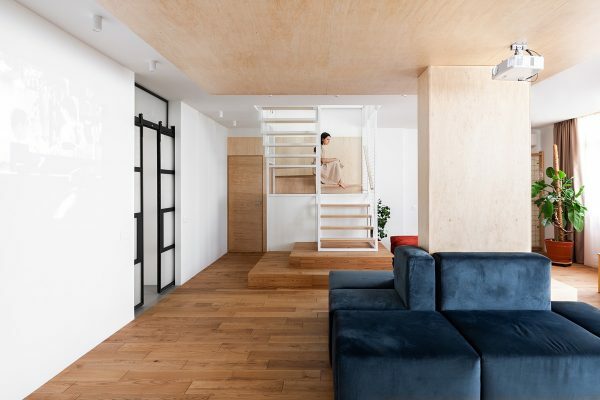 The first one appears to have two kids’ beds stacked in a bunk-bed arrangement, but the upper volume is actually a treehouse-like playspace. The space beneath the kid’s bed is utilised for storage drawers. A built-in desk has been installed in the room, running from the foot of the bed along the entire length of the window wall. The colour scheme of the room is a dazzling mixture of pink, purple, yellow, lime green and blue, all balanced out by expanses of fresh white and earthy wood tone. 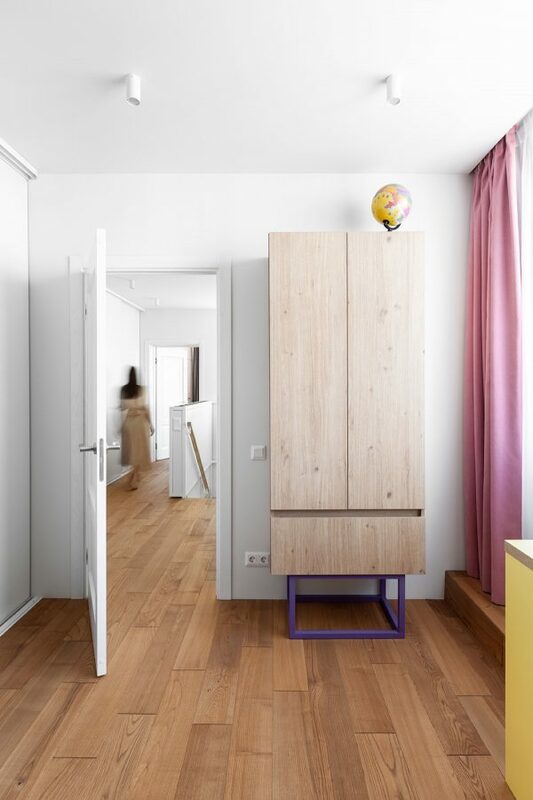 A freestanding childrens’ wardrobe is raised up on a bright purple frame. The second child’s bedroom is a vision of blue, with vertical painted stripes and sky blue window drapes. The space has a kid’s study by the window with a bright blue desk. 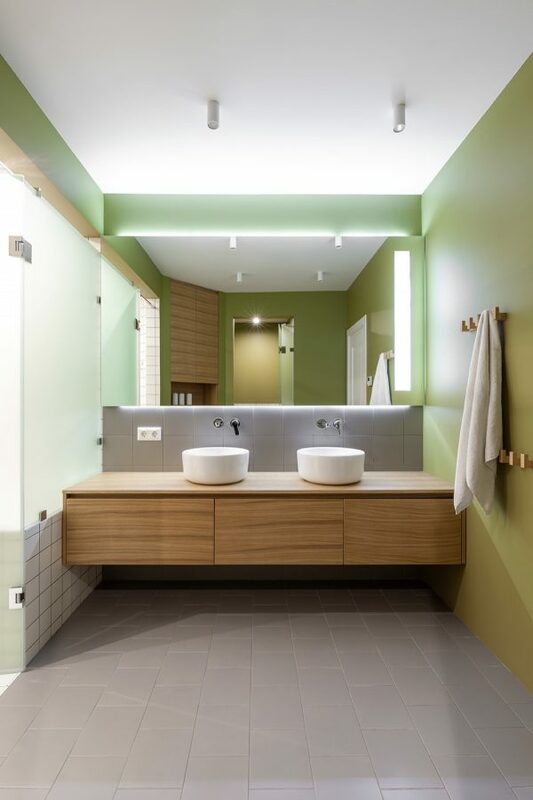 A wooden wall mounted vanity unit resides in a pea green bathroom. Smooth light grey tiles span the double sink bathroom vanity, and cover the entire floor. 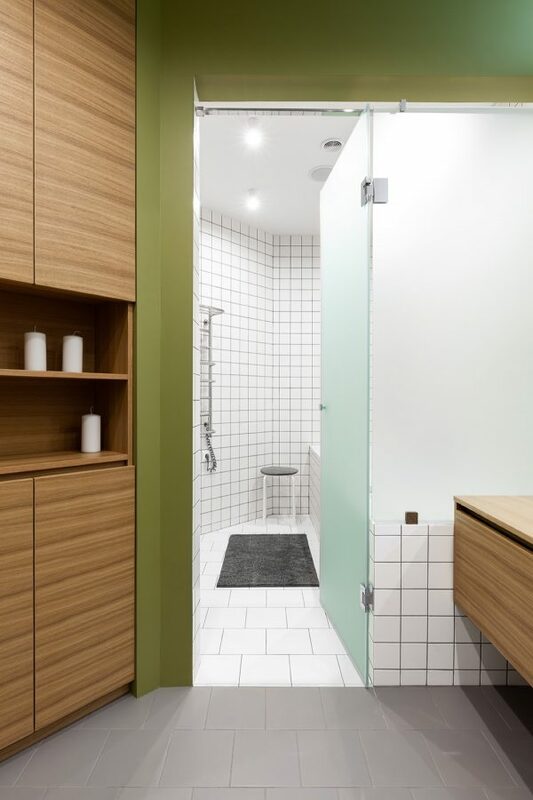 A wooden storage unit crosses the corner of the bathroom. 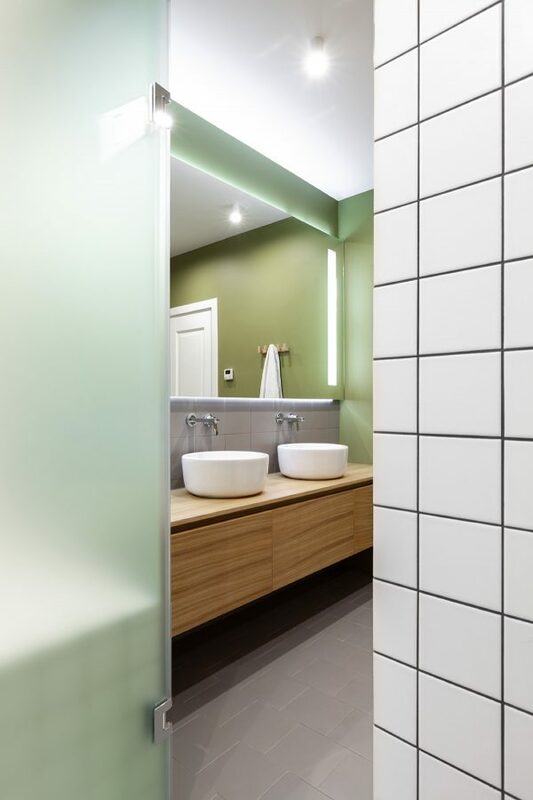 An opaque glass door separates off a wet zone containing a shower cubicle, a bathtub and a heated towel rail. A second door conceals a WC. 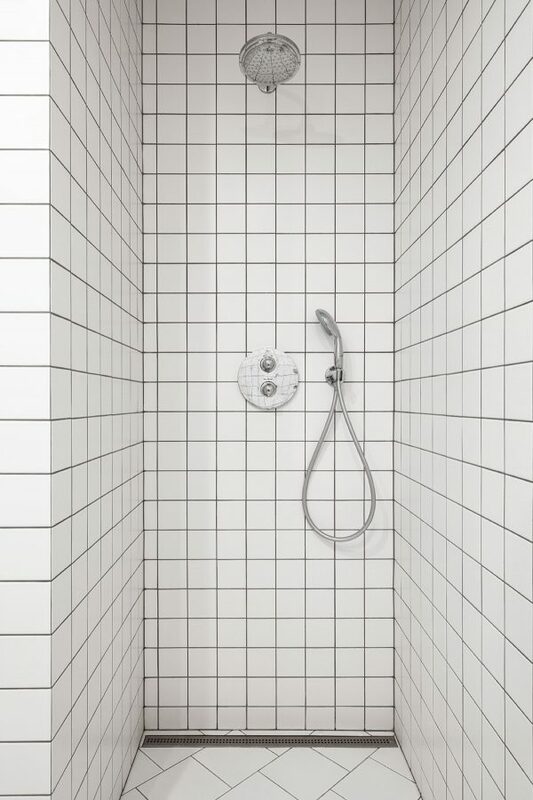 The shower cubicle is edge to edge in simple white tile. Chrome faucets and accessories dress the wash areas. 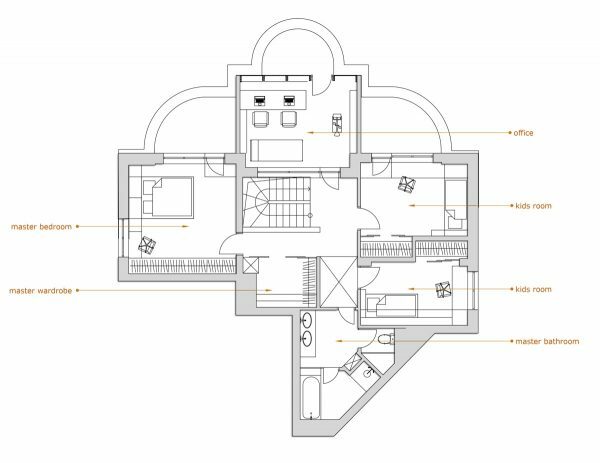 The floor plans reveal a multitude of extra rooms. 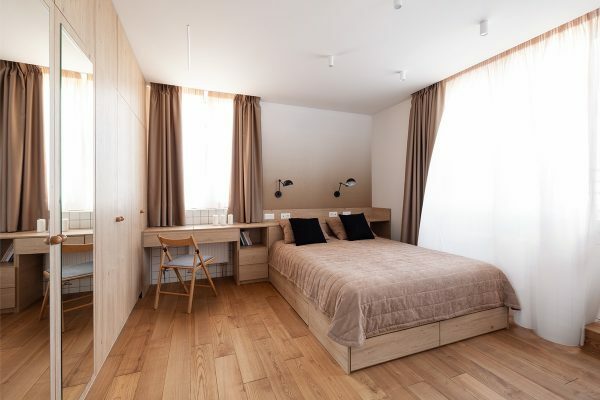 A guest bedroom is located on the ground floor, along with a dedicated laundry room and a separate kitchen store that is as large as the main kitchen itself. We see that the hallway closet is almost as large as the kitchen too, providing more than enough space for the entire families outdoor clothing with plenty of room left over to hang guests coats too. 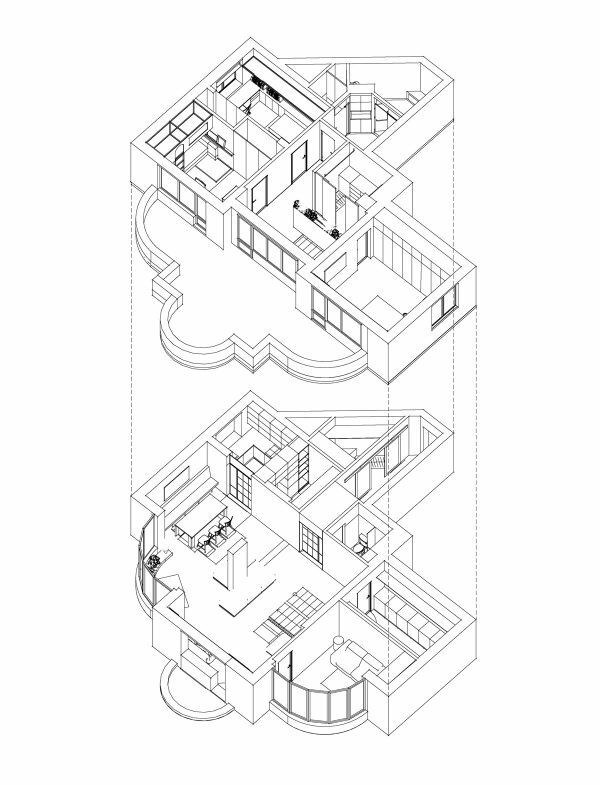 The upper floor plan reveals there is a dedicated home office with a double workspace. There is also an additional master closet out on the landing.